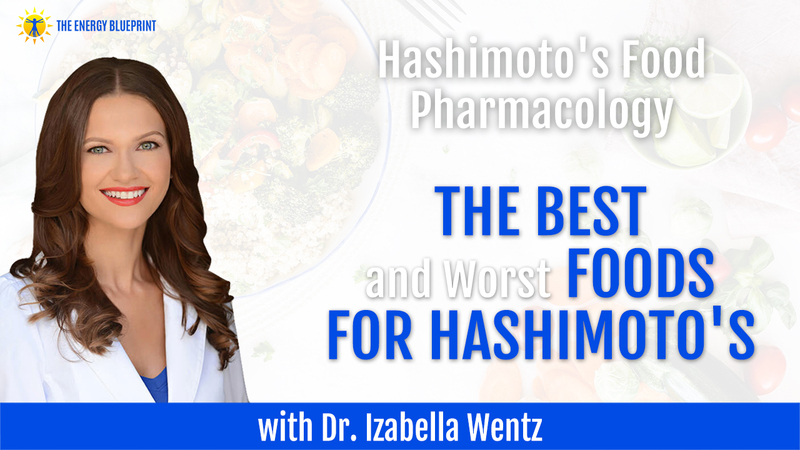 In this episode, I am speaking with Dr. Izabella Wentz—a Doctor of Pharmacology, an internationally acclaimed thyroid specialist and New York Times best-selling author—about the best and worst foods for Hashimoto’s and her latest book Hashimoto’s Food Pharmacology. What are the worst trigger foods for Hashimoto’s? Ari Whitten: Everyone, welcome back to the Energy Blueprint Podcast. I’m your host, Ari Whitten. And today I have with me for the second time on the podcast, Doctor Isabella Wentz. She is a Doctor of Pharmacology and an internationally acclaimed thyroid specialist and licensed pharmacist who has dedicated her career to addressing the root causes of autoimmune thyroid disease. After being diagnosed with Hashimoto’s thyroiditis in 2009 Dr. Wentz is the author of the New York Times bestselling patient guide, Hashimoto’s Thyroiditis Lifestyle: Interventions for Finding and Treating the Root Causeand the recently released protocol-based book, Hashimoto’s Protocol: A 90 Day Plan for Reversing Thyroid Symptoms and Getting Your Life Back. As a patient advocate, researcher, clinician and educator Dr. Wentz is committed to raising awareness on how to overcome autoimmune thyroid disease through the thyroid secret documentary series, The Hashimoto’s Institute Practitioner Trainingand her international consulting and speaking services offered to both patients and healthcare professionals. So welcome, yet again for number two, Doctor Isabella Wentz. Dr. Izabella Wentz: Ari, thank you so much for having me. It’s such a pleasure to be here with you. Ari Whitten: Yeah, likewise. Always a pleasure to chat with you. And I’m also – I should add to my introduction – also a personal friend of mine, which it’s always nice to have my buddies on the podcast. So, to start us off, I also want to talk about this, which is your new book, Hashimoto’s Food Pharmacology. And we’re going to be talking a lot about this. This is basically a dietary guide and cookbook for people with Hashimoto’s. And so, we’re going to dig into some of the specifics of the best nutrition approaches to dealing with Hashimoto’s for people who have it. But first I would love if you could introduce yourself, just talk a bit about your background – you yourself actually have Hashimoto’s. So, you have some personal vested interest in finding answers and solutions here. So, just tell me about your background and your experience and your story with Hashimoto’s. Dr. Izabella Wentz: Sure. So, in full disclosure, I was never interested in the thyroid during pharmacy school. I always thought that if you had a thyroid condition, you either got pills to make more of it or pills to make less thyroid hormone. And it wasn’t really until I graduated from pharmacy school and started having more and more symptoms with every passing year and was diagnosed myself with Hashimoto’s and an underactive thyroid is when I really became interested in thyroid, and when I really understood the complexity of thyroid conditions. And really at that point is when I understood that most thyroid conditions were caused by an autoimmune condition. So, this is sort of how I became a Hashimoto’s expert slash human guinea pig was really through my own diagnosis and taking my background as a pharmacist and using the research methodology I developed as a consultant pharmacist working with people with very rare conditions, sometimes rare genetic conditions where only 10 cases had been described in the world. And so a lot of times with clients, I was used to digging into the medical research and patient forums and Pub Med. And just trying to find something that might work for them. Ad what was really amazing with my client work before I became the thyroid pharmacist was that a lot of these clients of ours, they were given things to do by their doctors that not only didn’t help them, but oftentimes would harm them. And just to give you one example, we’d have some children who had cerebral palsy and the doctors would often times see the children were making noises or screaming and they would say, “Let’s give this child and antipsychotic medication because clearly he’s got a behavior issue.” And a lot of times, you know, the team I was part of, we would look at and try to figure out what was actually going on with that particular individual. And many times, it was pain or some sort of other kind of imbalanced that they were having. And we would utilize physical therapy and other types of therapies to resolve that pain. And then that person was no longer screaming or that person was no longer – quote unquote – “having behaviors.” And we would be able to avoid the use of psychotropic medications. And so, to make a long story short, I was seeing that doctors didn’t always know everything, and I thought maybe there was more to Hashimoto’s than just taking a thyroid medication. Of course, I’m a fan of thyroid medications, but we can’t expect just one thing to heal us, as you know, a lot of times it’s a combination of lifestyle that really creates that profound healing in the body. Ari Whitten: Yeah, absolutely. I want to zoom out and just for people who are not familiar with this condition, talk about sort of what it is, what Hashimoto’s is and how prevalent it is and what’s – well actually save the next layer of questions for after those questions. Dr. Izabella Wentz: So, Hashimoto’s is autoimmune condition that affects the thyroid gland. What is happening in very simple terms is the immune system starts to recognize the thyroid gland as a foreign invader and starts to attack the thyroid gland. This eventually results to the thyroid gland not being able to produce thyroid hormone. And we end up with an underactive thyroid or hypothyroidism. There’s a lot of consequences to that. We can talk about that a little bit more. The key thing here I guess is that it’s a very common condition. So, we’re looking at anywhere from 10 to 20% of the general population might have this condition depending on which studies are done. There are some studies that only uncover the late stages of the condition. And this is going to be the TSH test that most people, when they suspect they have a thyroid condition, they’ll go to their doctor and their doctor will do this test. And that will usually pick up just the very late stages of the condition. When we do more advanced diagnostic testing, we can pick it up – the condition – in a far earlier stage, make a lot more interventions to prevent some of that damage. And then we also find that the condition is far more prevalent. Ari Whitten: Hmm. And that ability to pick things up early is pretty critical here because there is an actual destruction of the thyroid gland going on. So the longer that takes place, the less likely you are to – even if you get to a place where you are doing things that are effectively slowing or stopping or potentially reversing the thyroid destruction. I would imagine it’s much harder to end up with a fully functional thyroid gland. If you’re starting that much later in the progression of the disease. Dr. Izabella Wentz: You’re absolutely right. It’s much easier to prevent the damage to the thyroid gland than it is to try to regrow a thyroid gland. I’m not saying it’s not possible to regrow our thyroid gland. I’m never going to hold back that from people, but the majority of people who are discovered to have thyroid conditions in the late stages will need some sort of thyroid hormone replacement and that is, you know, as a pharmacist, I’m a big fan of using appropriate hormones and appropriate medications when they’re indicated. Ari Whitten: Yeah, absolutely. So, I would love if we could talk about the sort of conventional thinking on the causes of Hashimoto’s, like within conventional medicine and their approach to treatment. And then contrast that with what you’re doing and how the more functional medicine or holistic based paradigm of what’s going on in Hashimoto’s. Dr. Izabella Wentz: I think a really big focus of conventional medicine is genetics. And a lot of times they’ll say, well, you’ve got these genes and your mom had it, so therefore you’re going to have it. And I feel like there’s a lot of great research going into that, but you know, unfortunately I feel like that’s not very empowering because we can’t really do anything to get different genes than the ones we have, at least not in this day and age. And it’s also not super accurate given the right types of conditions. We can actually see really, really high rates of Hashimoto’s. I personally was downstream from Chernobyl, the nuclear fallout. And that to me, I believe was part of my triggering root cause. Where people who were closer to it, there were crazy statistics with up to, I want to say 80% of children within a certain age range within a certain radius of that incident that ended up having Hashimoto’s. So, it’s like, you know, you can say that it’s genetics all you want. Yet children that were genetically similar, further away from that nuclear disaster did not have Hashimoto’s at those high rates. So, this is where I think functional medicine and lifestyle medicine is so important because we really look at what are some of the triggers in our own environment that can bring on disease and how we modify these triggers. How do we, maybe… We can’t really avoid everything, right? We can’t live in a bubble, but what can we do to modulate or modify that? And so, from a functional medicine standpoint, toxins would be a huge one. Food sensitivities, nutrient deficiencies, chronic infections, impaired ability to handle stress, impaired ability to handle toxins as I think I mentioned in the beginning, but also gut issues are going to be another one. So, contrast the functional medicine approach to the conventional medicine approach. Conventional medicine is basically you have this condition, we know you have it and if your thyroid has burned itself out completely, we’ll give you thyroid hormones. We’ll check you every few years for additional autoimmune conditions. But that’s kind of it, right? And if you have depression, if you have hair loss, if you have joint pain, we’ll send you to the respective specialists. So, for depression, you’ll go to a psychiatrist. If you have joint pain, maybe a rheumatologist, maybe a dermatologist for hair loss, whatnot. With functional medicine, our goal is to figure out what caused that condition and how do we modify it, right? So, we’re looking at using food as medicine, we’re using nutrients, digestive enzymes. We’re replenishing thyroid hormones if appropriate, and just trying to figure out is it an infection in your thyroid or is an infection somewhere else in your body that’s causing you to be out of balance? If that’s the case, great, let’s get rid of it and help you feel your best. Ari Whitten: Right. Absolutely. Within some of the evidence-based sort of skeptic circles, they think everything outside of conventional medicine is quackery and nonsense. There’s a sort of idea that they have that anyone who mentions toxins or detoxing is a quack who doesn’t understand any of the science. So, I just to ask you very directly, is there any evidence on any specific toxins and links to autoimmune conditions and can you speak to that a bit? Ari Whitten: I will say that there are some genuinely crazy people though. Dr. Izabella Wentz: There are genuinely crazy people out there. I hope that I’m not one of them yet. Maybe with more research I will be, right? Ari Whitten: Yeah. Well, I’d say there’s genuinely crazy people and then there’s a category of really knowledgeable experts who appear to be crazy by many people in the sort of conventional circles. Dr. Izabella Wentz: I will say coconut oil is great, but it will not carry your thyroid. So, there’s stuff out there like, you know, this one thing will cure your thyroid. That’s not what I’m talking about. But yeah, there are various types of chemicals that have been connected. The halogenated brominated chemicals are some of the biggest ones that have been implicated. I could really give you a lot of research and citations. I have I think maybe 600 for my first book and maybe 200 for my second book, that really detail various types of chemicals. And it goes as far as people who are, you know, within a closer radius to factories of this sort are going to be, have higher rates and people growing up of Hashimoto’s, people growing up in bigger cities have higher rates of Hashimoto’s. Chernobyl, I guess is the most well studied one. And we know that people who were closer to that had the highest rates of thyroid cancer as well aswhat they call benign thyroid disease, which anybody with an autoimmune thyroid condition will not say it’s benign. But yeah. So, we, we have a lot of really clear research that can connect various toxins to Hashimoto’s. Mercury is another one, with people who have mercury fillings. I really could give you a long list of those and be interesting. Ari Whitten: Yeah, a whole bunch of things. I’m curious, do you have any thoughts on how… Is there research on fluoridated drinking water and the incidence of Hashimoto’s? Dr. Izabella Wentz: There is some research with the incidence of thyroid disease. The last time I checked, it wasn’t specific to Hashimoto’s, but there was one interesting kind of study that was done in the UK. They fluoridate some parts of the communities and other parts they don’t, and they found that in the parts of the UK where the water was fluoridated, they presented with higher rates of Hashimoto’s compared to the one to the parts of the country where they did not. What’s also interesting is the higher the levels of fluoridation in that community, the higher rates of thyroid disease. So, I definitely feel like it deserves a lot more research. So, there are definitely some connections there. Another interesting one that we don’t typically think of and you know, fluoride is one of those public health interventions that’s meant to help us, right? Yeah, we don’t want people to have rotten teeth. Let’s give him fluoride. Another wonderful intervention, I’m being a little sarcastic, is iodine. We used to have the highest rates of thyroid disease due to iodine deficiency. And so public health officials began to add iodine to salt supply. Now, this was great for ending the high levels of iodine deficiency hypothyroidism, but unfortunately it was recognized that iodine is a narrow therapeutic index nutrient. So, some people were getting too much of it and that was causing thyroid disease as well. So, you know, in my book Hashimoto’s Protocol, I have a whole chapter and it’s actually the very first chapter. It just talks about liver support and some of the different types of toxins that have been connected to thyroid disease. And like I said, we can’t really live in a bubble. And so I do love your work when you talk more about resilience and it’s like how do you make your body more resilient and try to… Of course, we can try to avoid some of the toxins, but also how do we help our bodies get rid of them better. Ari Whitten: Yeah. Oh, you know, the way to my heart, that’s my favorite subject. So, I love the title of your new book, Hashimoto’s Food Pharmacology. And you’re specifically getting at this sort of food as medicine. You know, the sort of like the old Hippocrates quote that we’re also familiar with. I love that you’re doing that because it’s still unfortunately I think needs to be reframed for people that food can be absolutely medicinal. And there are a wide range of different things, different conditions and symptoms and areas where specific food nutrients can be as potent or even more potent than pharmaceutical drugs. And there’s a real lack of awareness around that subject. So, I just love what you’re doing. The whole concept of the book I think is phenomenal. How did you come to this idea of like this book? How did this sort of idea get spawned and what led you to create this? Dr. Izabella Wentz: I became a pharmacist because I was fascinated with how tiny substances can impact our bodies. And you can take, um, you know, a hundred milligrams of a pill and make a 200-pound man drop his blood pressure in his entire body. And that’s quite impressive. And you can take the same man and give him micro grams of a substance like LSD, and that person will start hallucinating. And that was why I became a pharmacist. I was just so fascinated and looking for how can I find the next cure, what medication is out there that can really transform a person, and how do I cure disease. And that really was my goal was to find a new cure and help people cure their diseases. Unfortunately, when I got into the real world, it wasn’t quite like that. It was like, yes, I was giving people medications, but they just didn’t have the profound effects that I would be hoping for, you know, with a few exceptions. Of course, there is, if you have a terrible infection and you take an antibiotic and then yes, you end up with a cure. But in most cases, it was like, you take this one pill and this pill is telling your body to do this. Right? But then everything else in the environment is telling the body to do this. And then we end up being out of balance. And for example, with Hashimoto’s we have thyroid hormone. And we take the thyroid hormone and it’s great, and it’s giving our body more of this hormone that we’re not able to make. But then we’ve got these other messages in our body that are saying, go destroy the thyroid. Right? And so, then we end up with a deficiency in thyroid hormone. Again, because something is telling us to destroy the thyroid gland and we’re not getting enough of those messages that are saying stop destroying the thyroid gland and heal the thyroid gland and, you know, heal the inflammation in your joints. And so, I wanted to really kind of make people aware that it wasn’t just medicines that had these potent effects on the body. Nutrients can have that potent effects and so can foods. And that’s how I came up with the food pharmacology concept was really giving people this I guess, knowledge and awareness that everything in our environment is going to be contributing to our healing, not just the medications. And we should use everything that we can to our advantage. Ari Whitten: Yeah, absolutely. So, with that in mind, let’s talk some specifics. So, what we’ll start with maybe the positive side of what do you think some of the most beneficial foods are for people with Hashimoto’s? Dr. Izabella Wentz: So, I kind of a nerd and I was to work in outcomes research as well. And so, there are things that I found to be helpful, but it’s always, you’re never know like, is this just helping me? Am I just an oddball? And then there are things that we’re helping my clients. And then, I started keeping the outcomes for that. And then I decided, well, I have more readers than I could possibly ever see as clients. Let me track down some of these outcomes and results. And I found there were some specific things that a lot of people found beneficial. Two Really beneficial things are super easy to incorporate into your life: One is going to be bone broth. And then green smoothies. Now with bone broth, we’re going to see improvements and people’s hair and skin, which are two really big things that people complain about when they have thyroid disease. They’ll say, you know, my skin just looks really dry or my hair’s falling out. They’re also going to see improvements in joint pain where they’re no longer going to be having as much pain as they did in their bodies. But, really, really amazing is that people with bone broth. Okay. So, I compared like how responsive people were to medications versus like to bone broth and with medications. About 40 to 70% of people would say that medications make them feel better, right? When they take thyroid hormone medications, which are great and you should definitely take the right ones for you. But with bone broth, about 70% of people said that that was significantly helpful for them. And so, they saw improvements in energy and mood. And it’s kind of amazing because some of these parameters I was like, wow, people were more energized by bone broth then they were by certain thyroid medications. And I just think that’s super powerful. If you can take a food that’s super easy to make and just incorporate it into your daily routine and it’s tasty, it’s great for a lot of different parts of your body and utilize that to your benefit. And then green smoothies. So, a lot of times we’ll see people have trouble with digesting things when they have Hashimoto’s. Part of that is the deficiency of thyroid hormone. Part of that is the autoimmune process and when they start blending up their foods into a smoothie, they get a nice kick of nutrients that are available to them right away. Two, they don’t have to digest everything because digestion can be a hard process on their bodies. And with green smoothies we see improvements. A gain in energy was 82%, 60% had better mood and then 40% notice that, you know, maybe they weren’t trying to lose weight, but their weights kind of started to normalize. And, I love that when you’re not like really putting pressure on yourself when you can just add these things into your life that are easy to make them delicious. Cause you can just pop a bunch of stuff in a blender and be on your way with breakfast and lunch. Ari Whitten: Yeah, absolutely. Do you have any thoughts on, while we’re on the subject of green smoothies, do you have any thoughts on key ingredients to put in those smoothies? Dr. Izabella Wentz: I have my root cause green smoothie that I really love that is going to be a mix of good fats. I’ll put avocado, coconut milk in there, and then chia seeds if depending on what people can tolerate. I’ll also add some green veggies. So, something like a lettuce that is not currently infected with, you know, whatever the bad strain of E Coli is would be really great to have in there. Also, carrots, cucumbers, celery or some options, depending on what you like. And then I’ll put one serving or so of berries. Blueberries are especially great for thyroid. They contain a substance called myoinositol, which when studied by itself has been shown to actually normalize thyroid function and people who have a slightly under active thyroid. And I love to use protein powders. I use a hypo-allergenic one. That’s hydrolyzed beef protein that is hypoallergenic for most people with Hashimoto’s. I personally used to use a lot of whey protein, but we’ll get into some of the inflammatory foods for people with Hashimoto’s and unfortunately whey is one of them. So, we need to go with more clean protein sources like pea or hydrolyzed beef protein in that case. And that’s kind of that. And different people might add different ingredients, make it thicker, thinner, might add ice depending on what their pallets like and crave that particular day. Ari Whitten: Gotcha. What do you think of cruciferous vegetables? And I know that this is a sort of a hot topic within the hypothyroidism community and there’s a lot of mixed opinions out there. What’s your take on the research? Dr. Izabella Wentz: Okay. When I first was diagnosed with Hashimoto’s, I was like, the recommendations were like, have a bunch of coconut oil, right? And do not eat broccoli. God forbid you eat broccoli because that’ll just destroy your thyroid. And I followed that for a while and I was like, yeah. And I added Brazil nuts. That was another recommendation. I was like, yeah, no difference here. Right? And I’m looking deeper into the research. The cruciferous vegetables are prohibited by some older references for thyroid disease because they are considered to be goitrogens. Now goitrogen is, it’s kind of a broad term when you look into it. And what it basically means is a substance that could interfere with thyroid function. And there are, you know, dozens of different ways that have described in which a substance can do that. And some of the ways are through inhibiting the absorption of iodine into the thyroid gland. This is how broccoli and cauliflower can potentially interfere with thyroid function. Now this can be a huge deal if you’re iodine deficient. Now remember what I said is now we have iodized salt. So, most people do not develop iodine deficiency hypothyroidism. Therefore, the broccoli and all those vegetables should not be an issue for them. And what’s more important is even if they are iodine deficient, which I would estimate less than 10% of people with Hashimoto’s are, they can actually just steam or ferment vegetables and they could still eat them and be just fine with them. There is one caveat though, in people who have CBO who, which tends to be more common in Hashimoto’s and people with the CBS gene mutation that’s upregulated. They may have adverse reactions to some of the crucifers, but that’s through different mechanisms. The one goitrogen that I do worry about is, is soy. And that interferes with thyroid function in a different way. It actually interferes with the thyroid peroxidase enzyme, which is basically the enzyme that a lot of us can have antibodies towards. And so, there is some connection between soy intake and higher levels of thyroid peroxidase enzyme antibodies, or thyroid peroxidase antibodies. So therefore, that would be one particular goitrogen that I would avoid. But again, it’s like a different mechanism. You’re comparing apples to oranges. I know it’s a little bit nerdy. I have a breakdown of it on my website and in my book, if anybody’s like interested in going through all the details. Ari Whitten: Nice. So, soy sounds like something that’s not on your recommended list. Does that include all soy products or like more the sort of standard soy products? Does it also include things like tempeh and the fermented soy products? Dr. Izabella Wentz: Unfortunately, soy tends to be a common food that people are going to be sensitized to. And, I think fermented soy or miso, if that’s what you grew up eating and you never ever had the kind of crap soy that’s out there, then you might be fine with it. But there’s a really good chance that if you’ve been exposed to the soy that’s present in our processed foods, if you’re on this earth, then there’s a good chance you’re personally going to be sensitized to even the good types of soy. That’s been my experience at least. And we find about 60% of people with Hashimoto’s will respond with higher thyroid antibodies when they include soy in their diet and excluding soy, they will have a lowered amount of thyroid antibodies and another symptom that correlates with that, is anxiety and palpitations. So, if you’re somebody that is having anxiety or palpitations and you’re eating a lot of soy, I would recommend that you try to eliminate that for two to three weeks and see if that changes for you. Ari Whitten: Interesting. So, what other foods have you found are really not very good for people with Hashimoto’s? ecause a lot of times people maybe more likely to cross check to goat’s milk and sheep’s milk that people are always like, I can’t have regular my like what can I have? Or can I have goat or sheep? And a lot of times they may react to those but camel milk, a small percentage of people will react to camel milk and that seems to be tolerated by people with Hashimoto’s more. Ari Whitten: interesting. Okay. So, gluten and soy are out. What about grains more broadly? Dr. Izabella Wentz: Depending on the person. So, in some cases, yes, we see people react to grains, especially corn. This is oftentimes going to be connected to people that have joint pain. And people that also have gut issues or irritable bowel syndrome issues, a lot of times we’re going to find that grains could be part of their triggers. Ari Whitten: Interesting. Okay. Gluten, dairy, soy, grains, maybe, maybe not. And anything else that is worth mentioning there is sort of the major trigger food that, that people don’t do well with? Dr. Izabella Wentz: Eggs, nuts, seeds and nightshades can be some of the triggering foods. My book is based on not just one specific dietary protocol. It’s based on three helpful dietary protocols that I’ve found for people with Hashimoto’s. So, there’s an introduction diet that goes gluten free, dairy free, soy free, and then some people have a complete elimination of their symptoms and antibodies just by following this for three months. And this is something that, you know, a lot of times we can start with and it’s pretty straight forward. We eat real food and we can recover our health that way for people. They may need to dig deeper. And I have more of a Paleo Diet-like template where we start eliminating a few more foods to see which are reactive. And then the furthest, the deepest diet is going to be based on a template of the autoimmune Paleo Diet where we remove some of these additional foods. And I just want to say these diets are not meant to be like forever and ever like you do not eat these foods and you only eat these foods, because we want to make sure that we’re figuring out what’s causing inflammation in our bodies today. Remove that for a time period and then work on building that resilience back, work on our body so that we could add the foods back in. So, the cookbook is meant to grow with a person and some people might need to start with a more restrictive diet. Like let’s say if they have a ton of symptoms and multiple autoimmune conditions. For others, they may be able just to cut out a few of the gluten, dairy, soy foods and see a complete revolution in their health. Ari Whitten: Yeah, I’m glad you mentioned that bit about, you know, that these are not meant to be forever because I feel like there’s a lot of people getting stuck on extreme diets and developing in some cases kind of debilitating fears of the bad foods that they’re not supposed to eat. And they ended up doing this very counterproductive thing of remaining on this highly restrictive diet and don’t realize that they’re poisoning themselves with fear and neuroticism and anxiety around their eating habits so much that the anxiety is probably worse than the actual food that they’re trying to avoid. Dr. Izabella Wentz: It’s known as Orthorexia and actually happened to me when I was first trying to get myself better and that’s why I’m so passionate about teaching people to be their own nutrition gurus. And I’d never had an eating disorder in my life before, but people who have had eating disorders are at greater risk for Orthorexia as well. But I just thought, you know, if I just cut out more foods that I would be healed. And that’s the absolute, you know, it’s very, very sad because you lose your own intuitive ability to connect with food. And my goal is to really restore that for people. With my case, I was on the GAPS diet and it was very heavy based in like nuts and seeds and, and all these other things. And I was losing weight, I was losing muscle mass, my skin was like gray and breaking out. And the issue was that I was reacting to nuts and I was eating a lot of those. And then there was like thousands of other foods that I wasn’t reacting to that I wasn’t eating. And I was just like, no, I just need to stay on this. I just need to eliminate more foods. And the other issue was that I had some gut dysbiosis and issues that were causing me to not digest my food properly and therefore I was being reactive to everything. So, a big part of my healing was healing my gut and figuring out that I needed to actually add more foods back into giving myself some of that diversity. And adding digestive enzymes and adding certain nutrients that I was missing. And you know, really that’s my hope with this book is to give people that ability to connect with their bodies so that they can start eating in more of an intuitive way and being able to tolerate a lot more foods. Ari Whitten: Yeah. With that in mind, to get very specific and sort of practical, let’s say somebody hears this, somebody has no clue what they should be eating right now and they’re listening to this and they’re hearing, okay, I should avoid gluten. I should avoid dairy. I should avoid soy. And then I’m good to go. Maybe I replaced my iodized salt with regular sea salt. The non-iodized is not enough for me. Is that like, am I pretty much good if I’ve modified my diet doing those things or are there more things? Are there more things that I need to learn? Dr. Izabella Wentz: I think that’s a really great start, to cut out some of the top inflammatory foods and you’d be doing that by cutting those out. But I also would want to look at the person as a whole. So, we talked about some of the other additional triggers and for some people, you know, it’s just gluten and that’s the only trigger that they have. And gluten is going to cause all these other events. But unfortunately, those are my easy cases and most people don’t seem to be easy cases, at least not the people I’ve had the last few years. A lot of times it’s a bit more complicated where they might have problems with sleep. Sleep apnea is going to be a huge thing that can trigger thyroid disease and exacerbate thyroid disease. So, if you are eating a really great diet but you’re still not sleeping and you’re not breathing at night, then you know, that’s something that you need to address. My kind of rule of thumb is if you’ve been on a clean diet for more than three months and if you’re still having symptoms, there’s definitely something else going on that you need to address. And that might be your stress response. That might be some infection that you might have that might be a toxin. And, and you know, and I say, I kind of say this jokingly, but sometimes it might be a person in your life, right? So, if you have a person that is causing you a lot of stress in your life or a situation that’s causing a lot of stress, even eating the healthiest diet, you’re still going to be suffering and you’re still going to struggle. Ari Whitten: You need to treat them as any other toxin. Dr. Izabella Wentz: Exactly. Yeah. We can get rid of a lot of symptoms by getting rid of inflammatory foods and getting rid of inflammatory people works probably even better. Ari Whitten: Nice. So,of course people want to know what you eat personally and maybe what some of your favorite recipes are. So, can you take people through maybe a typical day of eating for you and maybe one or two of your favorite recipes? Dr. Izabella Wentz: So, I’m on, I’m a new mom, so I like to it super simple, and I start off my day with a green smoothie. That’s just something that gets made in a few minutes and the baby gets a little bit of his own little smoothie version. Then I like to put a little bit of bone broth on a slow cooker. So, I just throw in chicken legs or chicken drumsticks with celery, onions and carrots and top that off with water, some sea salt, apple cider vinegar, slow cook that and I sip on that throughout the day. The baby gets a little bit of that throughout the day as well. And then that kinda gets me through breakfast, right. And then I’ll have a little bit of bone broth throughout the day. Then for lunch I like to have different types of either salads or some sort of leftovers that I made the day before. For dinner it’s going to be generally something like a protein, with a lot of really good vegetables and a good fat. Lately, I’ve been doing a lot of slow cooker recipes and my goal for people is like not to make life even more complicated for them when they’re already sick and tired. Right, so, a lot of my recipes are going to be things you can make on weeknights, and really quickly and batch cooking and slow cooking and just utilizing whatever tools you have to make life a little bit easier. About 20% will be like more fancy for dinner parties, but one of the things you can do is like a chicken tandoori recipe that’s in the slow cooker. So, you just throw in some chicken and some coconut milk and some curry, different types of curry spices and let that slow cook. Super, super easy, super tasty. Ari Whitten: Actually, it’s raining right now, and it’s been a stormy and rainy for like a week straight. So, but you know, are winter is, you know, pretty, mild sissy winter compared to Colorado winter. Dr. Izabella Wentz: Yeah, it’s been real. We’ve got a lot of sunshine though, but we’ll be like, okay, now you wake up and there’s a foot of snow. Paella is another fun recipe that I have in there. Again, it’s something that can be made in like 20 to 30 minutes all together, serves a big party and you get a lot of leftovers. And I also have a lot of traditional Polish recipes that have been modified. Ari Whitten: I liked that. It’s almost like a tribute to your ancestry. Dr. Izabella Wentz: Oh, it’s amazing because a lot of these healing foods are things that my grandmother would make and they’re real foods. They’re nutrient dense and powerful, powerful healing capacities. One of them is a beet soup. We know that beets support methylation and support detoxification. And that’s something that’s really tasty and I’ve made it really easy. My grandmother would cook it for like six hours by, you know, peeling everything and chopping it super fine and I just like throw things in there and it’s still tastes really, really good. Ari Whitten: Nice. Do you have some recipes for gluten free pierogi? Dr. Izabella Wentz: That’s going to be the next cookbook. Um, but yeah, actually my mom and I are working on a gluten free Pierogi recipe, so anybody that is going to be coming to visit thyroid pharmacist and getting on my email list will be the first to know. Ari Whitten: Excellent. So, thank you so much for this interview. I’ve really, really enjoyed it. And I’m super excited for the release of your new book. When does it actually get released? Dr. Izabella Wentz: March 26th. Ari Whitten: Okay, awesome. And where do you want to direct people to get this book? Dr. Izabella Wentz: Anywhere that books are sold. Barnes and Noble is great. And Amazon always has special deals on it where they’ll discount it and you can get it in two days if you have Amazon prime, that sort of thing. Definitely it will be in, in stores all over. So, if you happen to be at a store, you know, take a picture, send me a selfie. It, I’d be very excited to see you. Ari Whitten: Awesome. Well thank you so much Dr. Wentz, really a pleasure always to connect with you and I wish you an amazing book launch and I’ll be supporting you and helping you get the word out. So, I hope it’s, I know your last one was massively successful, so I hope this one is as successful or even more. Dr. Izabella Wentz: Thank you so much for your kind words and thank you so much for the work that you’re doing in the world are really appreciate it. Ari Whitten: Yeah, thank you. The feeling is so mutual, so it’s such a pleasure. Thanks so much, Dr. Wentz. 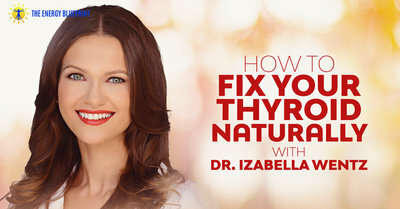 Listen in to the first podcast I did with Dr. Izaballa Wentz on How To Fix Your Thyroid. Ari and Izabella, thank you very much for the detail in this information. I have a diagnosis of Hashimoto’s and still have 100-200 TPO antibodies with years of careful attention to my wellbeing. The tip about Camel milk is exciting as I live in Western Australia, and it is easy to obtain. My daily comfort “thing” is a tea, and I truly cannot enjoy it if I use coconut/almond/soy/rice/ etc !!! !